This name uses Spanish naming customs: the first or paternal family name is Fayad and the second or maternal family name is Meneses. Omar Fayad Meneses (born 26 August 1962) is a Mexican politician from the state of Hidalgo who has served as a federal deputy and senator. He is currently the Governor of Hidalgo after winning the 2016 gubernatorial election. He is a member of the Institutional Revolutionary Party. Fayad was born on 26 August 1962 in Zempoala, Hidalgo to a Lebanese father and a Mexican mother. He obtained his law degree from the UNAM in 1985. After his graduation, he worked in Attorney General of Mexico's office for several years. In 1989, he moved to the National Institute of Penal Sciences (INACIPE) and later served at various education posts in the state of Hidalgo. He served as Hidalgo's secretary of public education and attorney general during 1996–98. He then served in several public safety and security capacities, including as a police commissioner or customs administrator. He also made regular appearances on radio programs as a political analyst. In 2000, Fayad was elected to the LVIII Legislature as a federal deputy, serving as secretary of Special Commission on Public Safety and sitting on the Communications, Government and Public Safety Committees. He resigned in April 2003. After his brief spell in Congress, Fayad returned to the Hidalgo state government, serving as Secretary of Agriculture (2003–05) and Secretary of Social Development (2005–06). In 2006, he ran for and won the municipal presidency of Pachuca. During his mayoral spell, he presided over Mexico's mayor association. In 2009, Fayad returned to Congress, serving as parliamentary secretary of the Commission of Strengthening Federalism. Three years later, he ran and won a campaign for Senate, where he would serve in the LXII and LXIII Legislatures. He served on an array of commissions, including Public Safety, which he presided. In 2010, Fayad was selected as the leader of the Institutional Revolutionary Party in Hidalgo. Fayad was strongly criticized in October 2015 when he attempted to introduce a new law against cybercrime that also criminalized the freedom of expression. One organization billed it "the worst Internet-related bill in history". On 2 February 2016, Fayad left the Senate in order to seek the PRI nomination for Governor of Hidalgo. He won the gubernatorial election later that year and was sworn-in as governor on 5 September 2016. He married actress Victoria Ruffo in 2000. The couple has two children. 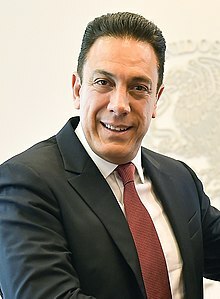 During Fayad's term as municipal president of Pachuca, he designated Ruffo as the local director of the National System of Integrity and Familial Development. In February 2016, Fayad was hospitalized after suffering an anaphylactic shock triggered by Rocephin. ^ a b c d e f g h i j k "Sen. Omar Fayad Meneses". Secretaría de Gobernación. Retrieved 2016-06-09. ^ López, René (2016-02-03). "Nueve cosas que no sabías de Omar Fayad". Ultra (in Spanish). Retrieved 2016-06-09. ^ Mota, Dinorath (19 April 2010). "Omar Fayad, nuevo líder del PRI en Hidalgo". El Universal (in Spanish). El Universal Compañía Periodística Nacional. Retrieved 2011-03-31. ^ Aguilar, Katrina (2016-02-04). "Omar Fayad y Martín Orozco piden licencia en Senado; van por gubernaturas". 24 Horas (in Spanish). Archived from the original on 2016-08-01. Retrieved 2016-02-09. ^ González, Moisés (2016-03-10). "Victoria Ruffo cumplió 15 años de matrimonio con Omar Fayad (FOTO)". People en Español (in Spanish). Retrieved 2016-06-08. ^ Aguilar Serrano, Mayra (2006-02-19). "Victoria Ruffo es ya primera dama de Pachuca". Crónica (in Spanish). Retrieved 2016-06-09. ^ La Jornada (2016-02-19). "Hospitalizan a Omar Fayad por abuso de medicamentos". Zócalo (in Spanish). Retrieved 2016-06-09. Pachuca, formally known as Pachuca de Soto, is the capital and largest city of the Mexican state of Hidalgo. It is located in the south-central part of the state. Pachuca de Soto is also the name of the municipality of which the city serves as municipal seat. Pachuca is located about 90 kilometres (56 mi) from Mexico City via Mexican Federal Highway 85. There is no consensus about the origin of the name Pachuca. It has been traced to the word pachoa, Pachoacan, and patlachuican. Manuel Ángel Núñez Soto is a Mexican politician affiliated with the Revolutionary Institutional Party (PRI). He is a former governor of Hidalgo. Jesús Murillo Karam is a Mexican lawyer and politician affiliated with the Institutional Revolutionary Party (PRI). He served as governor of the state of Hidalgo from 1993 to 1998. In 1998 he became Undersecretary of Public Security and then joined the campaign of Francisco Labastida for President of Mexico in the year 2000. He is of Lebanese descent. Rodolfo Torre Cantú was a Mexican physician and politician. He held a number of public offices, such as Federal deputy, Secretary of Health of Tamaulipas and Director-general of the DIF in Ciudad Victoria. While running for governor of Tamaulipas as the candidate of the PRI, he was assassinated, apparently by agents of a drug cartel. Torre was murdered alongside a Tamaulipas lawmaker, Enrique Blackmore, on 28 June 2010 near Ciudad Victoria, which is approximately three hours south of Brownsville, Texas. Felipe Calderón promised a full investigation, saying, "the fight against drug cartels must continue". He further stated, "This was an act not only against a candidate of a political party but against democratic institutions, and it requires a united and firm response from all those who work for democracy." Torre's assassination is the "highest-profile case of political violence" in Mexico since the murder of Luis Donaldo Colosio. José Francisco Olvera Ruiz is a Mexican politician and a member of Institutional Revolutionary Party. He was Municipal president (Mayor) of Pachuca and since April 1, 2011 is serving as Governor of Hidalgo. Alejandro Tello Cristerna is a Mexican politician affiliated with the PRI. He is the current Governor of Zacatecas and also represented the state as a senator during the LXII Legislature of the Mexican Congress and first four months of the LXIII Legislature. Francisco Javier García Cabeza de Vaca is a Mexican politician affiliated with the PAN, and the current Governor of Tamaulipas. García Cabeza de Vaca has previously served as a local and federal legislator, having served one term in the Chamber of Deputies and three and a half years in the Senate. José Antonio Gali Fayad is a Mexican politician affiliated to the PAN. He was the Governor of Puebla and previously served as the municipal president of Puebla City from 2014 to 2016. Quirino Ordaz Coppel is a Mexican lawyer and politician affiliated with the Institutional Revolutionary Party. He is currently serving as the Governor of the state of Sinaloa since January 2017. He previously served as a federal deputy for the VIII Federal Electoral District of Sinaloa from August 29, 2015, to March 1, 2016. Delfina Gómez Álvarez is a Mexican politician affiliated with the National Regeneration Movement (MORENA). She serves as a senator from the State of Mexico in the LXIV Legislature of the Mexican Congress. She also has served as a federal deputy and mayor.